Waiting to be experienced in a quiet peaceful setting, located in a corner of the Raven Faerie, our Gallery of displayed works awaits. Ample seating invites one to relax and take in the creations of Artisans who tell the tale of mythology, fantasy and mystical realms for the mind willing to open and wander through portals of what another's mind has seen. 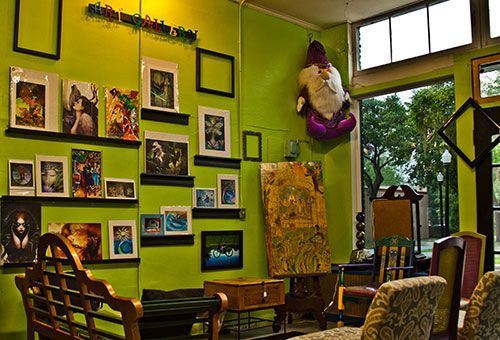 This area is an on going outreach for local talents who wish to display or sell their work. We invite you to tell your family and friends who may be gifted in this genre to inquire about our Gallery. From woodworking, painting, photography, metal to clay we have a place for your work to be displayed. The seating surrounds the gallery for those wishing to see head on and peripherally!